← Microchips for Dogs & Cats: Why should you microchip your pet? Most of us will see it time to time; a dog traveling unrestrained in the back of a pickup truck. At first glance, the pooch looks like they are having the time of their life, but who’s looking after their safety? The dog’s owner? It is estimated that at least 100,000 dogs die this way each year. Most of us don’t even think about the danger a dog (or any pet) faces when traveling unrestrained in a pickup truck (or any car where the pet can roam freely). 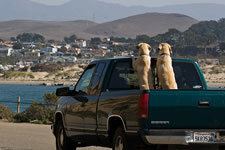 Here are some myths and facts about traveling in a pickup with your pet. I’m only traveling a short distance and I live in the country. It’s not necessary to restrain my dog in the truck. FALSE Did you know the majority of car accidents happen within 5 mile radius of your home? Even the mildest fender bender can end with tragedy if your pet isn’t properly restrained. No matter how long or short your travel will be, secure your pet correctly. I tied my dog’s leash to the inside of the truck bed. He won’t be going anywhere. FALSE Improper tethering is one of the biggest misunderstandings in regards to auto travel. There are two major problems that deal with tethering. First, if the tethered leash is too long you are actually increasing the danger for your pet. They risk the chance of falling out of the bed and being strangled. Second, most tethering systems work from the dog’s collar. If an accident should happen, all of the impact pressure would direct at the pets throat. The Humane Society of the United States knows of no brand of harness that has been proven safe for truck transportation. Tethering isn’t the safest way for your pet to travel. The safest way to travel with my pet in the bed of my truck is with an appropriately sized dog crate fastened behind the rear window of the truck. FACT This is the safest method of transportation for your pet. If an accident should occur you significantly reduce the chance of injury for your pet. Make sure that the crate is fastened in the truck bed. A bed topper would be a great option to protect your pooch from the wind and other weather conditions. Remember, letting your dog ride unsecured in the back of a pickup truck is not only unsafe and potentially deadly for dogs, it’s illegal in some states. Most states that don’t yet have legislation in place to protect dogs from this dangerous practice, are working on it. Regardless of the law, responsible pet owners have a moral duty to ensure the health and safety of their companion animals, especially when it comes to road safety. Angelica – safety is always a concern when traveling with animals. We are not verse in State laws on carrying animals in the bed of a truck; however, if they are confined to a crate and the crate is secured to the bed of the truck, and they are protected from wind and there are no obstacles to fall on them, and the temperatures and weather are not extreme… They should have plenty of water as well. They should also be acclimated to the crate prior to traveling. Take short trips with them if you can. this will be pretty traumatic for them. Certainly would be better if you could transport them in a carrier in the cab of the truck where you can watch them. Secure the crates to the bed of the truck. Covered is good but give them ventilation.